Bu SVG-faylın PNG formatındakı bu görünüşünün ölçüsü: 800 × 480 piksel. Digər ölçülər: 320 × 192 piksel | 1.024 × 614 piksel | 1.280 × 768 piksel | 1.000 × 600 piksel. 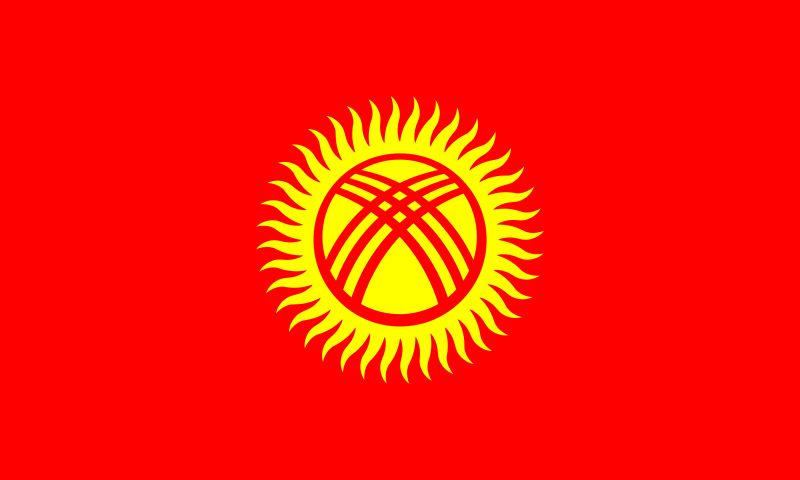 The 40 rays or lines are the 40 tribes of Kyrgyzstan who united to fight Chingiz Khan or Genghis Khan (Temujin), the Mongol Leader who conquered most of Asia in 1200. The center figure is the view from inside the yurta looking up at the rising sun. Müəllif Made by Andrew Duhan for the Sodipodi SVG flag collection, and is public domain. This vector image was created with ??. This image is not eligible for copyright protection according to the Law of the Kyrgyz Republic (6 of January 18, 1998 "on Copyright and Neighbouring Rights"); this image is in the Public domain worldwide (details). Ideas, methods, processes, systems, means, concepts, principles, discoveries and facts may not be protected by copyright. The results obtained with the help of technical means for the production of a certain type without creative activity of a man directly targeted for creation of an individual work. Comment – According to interstate and international compacts the Kyrgyz Republic is the legal successor of the Kirgiz Soviet Socialist Republic, therefore this license tag is also applicable to official symbols and formal documents of the Kirgiz SSR. 10:10, 1 avqust 2018 512 × 307 (7 KB) Nicobiev Fix an issue with clipping masks.